Leon Goretzka rescued a 1-1 draw for Joachim Löw’s side. A general view at the stadium tonight. GERMANY FANS PAID tribute to Mats Hummels, Jerome Boateng and Thomas Muller, who were all axed from the national team earlier this month, in their 1-1 international friendly draw with Sebia tonight. Joachim Löw controversially announced two weeks ago that the decorated trio will no longer be considered for international selection. All three players were vital members of Germany’s 2014 World Cup-winning side, but Löw decided to turn the page on the Bayern Munich stars. “I thank Mats, Jerome and Thomas for the many successful, extraordinary and unique years together,” Löw told Bild of his decision at the time. Germany played their first match since Löw’s announcement this evening, hosting Serbia at the Volkswagen Arena in Wolfsburg. The visitors went took a shock lead through Eintracht Frankfurt star Luka Jovic after just 12 minutes, but Leon Goretzka equalised in the 69th. The main talking point of the match however came as fans took the chance to make their voices heard. 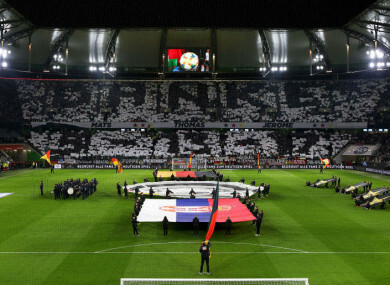 They unveiled a large display before the game that read: “Danke 5-13-17″ which referred to the numbers the three players wore with Germany. Germany have struggled to match their success in Brazil following their triumph at the 2014 World Cup. They were beaten by hosts France in the semi-final of Euro 2016, before losing to Mexico and South Korea last summer to shockingly crash out at the 2018 World Cup group stage. Löw’s side followed that up with a dismal Uefa Nations League campaign that saw them relegated from the top tier of the competition. Email “'Danke 5-13-17' - Germany fans pay tribute to axed Bayern Munich trio in Serbia draw”. Feedback on “'Danke 5-13-17' - Germany fans pay tribute to axed Bayern Munich trio in Serbia draw”.